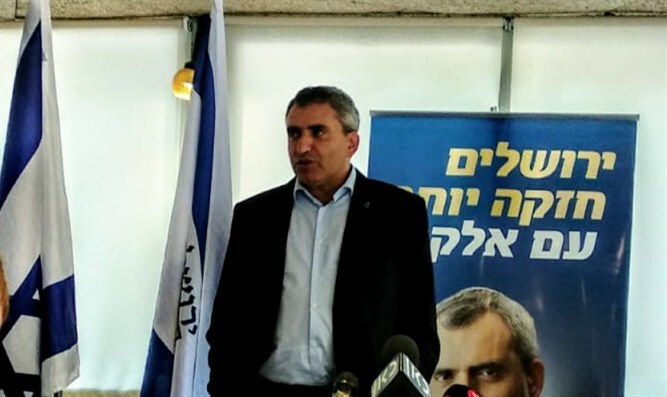 Jerusalem Affairs Minister and mayoral candidate Zeev Elkin presented his plan to rehabilitate Jerusalem in a meeting with journalists on Monday. According to Elkin, a lack of building has led skyrocketing housing prices in the capital, forcing young couples to abandon the city. Elkin said that Jerusalem needs a massive construction boom in order to rectify the situation, a figure he said can only be met by eliminating bureaucracy. "Jerusalem needs another 100,000 housing units within 20 years, every year about 5,000 housing units" said Elkin. "There is no other city in the State of Israel that has a bureaucracy about planning and building like Jerusalem - it is unnecessary, bureaucratic procedures must be simplified, and some of the stages should be abandoned." Elkin added that "where there is a lot of bureaucracy" then there are problems of "Machers", a term used pejoratively in Hebrew to describe a corrupt fixer. Regarding the economic situation of Jerusalem, Elkin said that the municipality of Jerusalem is on the verge of going bankrupt. "Five industrial zones need to be established and developed more government services and the establishment of commercial and leisure centers in the city of Jerusalem," said Elkin. Elkin also presented his plan to revamp Arab education system in East Jerusalem: "The curriculum in East Jerusalem must be transferred to an Israeli curriculum and done through competition, and if we allow competition, the Israeli program will win," alleged Elkin. Currently, we having something illegal. A generation here grew up on incitement in the Palestinian school system, which led to a wave of attacks by young people from East Jerusalem, and I am going to change that." With less than a month left to go before Israel’s local elections, the Jerusalem mayoral race remains tight, with a run-off vote likely between the top two candidates. A recent survey found progressive candidate Ofer Berkovitch getting the highest percentage of support with 22%, followed by Likud MK Zeev Elkin at 19%. In a distant third place is Moshe Leon, who in 2013 ran on the Likud ticket against incumbent mayor Nir Barkat, with 13% and haredi candidate Yossi Deitch at 12%. Notably, 31% of the respondents said they had still had not decided who they would vote for. Among the undecided, Berkovitch leads Elkin with 32% to his 27%. By law, a candidate needs to win at least 40% of the vote in order to become Jerusalem's mayor. Should no candidate reach 40%, the top two will go to a runoff.